Cozy Cabin “Camp Canoe" on Lake Cypress Springs, Waterfront w Boat Slip! Getaway to the quiet at this renovated lakefront cabin which sleeps 6 and includes a slip for your boat. The main floor living area is open to the kitchen and dining area and every floor to ceiling window showcases great lake views. Two downstairs bedrooms each have a queen bed and TV, with a shared bathroom in between, and the cozy loft upstairs has 2 twin beds and a bathroom. Our neighborhood just got a new paved road and driveways and sheets and towels are provided! One of only a few rentals on the lake, we also own the cabin next door, "Lakeview Canoe", which sleeps 8; check out that listing (VRBO #790965). The fully furnished kitchen has fresh paint, a new backsplash, stainless steel refrigerator and everything you need. Take in the incredible sunrise and sunsets from the huge deck with a patio table and a Weber grill. A kayak and paddle board are available and life jackets are provided. The fire pit with seating is just off the deck on the lawn (please bring firewood). Bring your boat or jet ski because a boat slip (11 feet wide x 22 feet long) is available on the shared community dock. Great swimming and fishing are off the dock, or at the sandy community beach. Lots of space for kids to run and explore! The updated property features new interior and exterior paint, all new furnishings and decor and a fun 'camp' theme. A set of sheets will be stacked on each bed for you to make up on arrival. Sorry, but per the Homeowner's Association Guidelines, no pets are allowed. A housekeeping fee for cleaning the property after check-out will be included. Lake Cypress Springs was named by D Magazine as one of the “Best Kept Secrets” in Texas. 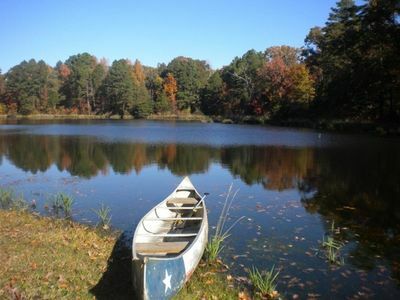 At 3400 acres and 7 miles long, the spring-fed lake is located in the East Texas piney woods of Franklin County. It is situated between the towns of Mount Vernon, Winnsboro, Pittsburg, and Mount Pleasant. Sorry, there is nowhere to rent boats on the lake. Only 90 minutes from Dallas, the property is easy to get to and is in the private, gated community of Barker Creek. Boat ramps are just minutes away to launch water toys, and the community dock is close for incredible fishing, fun swimming and a slip for your boat. 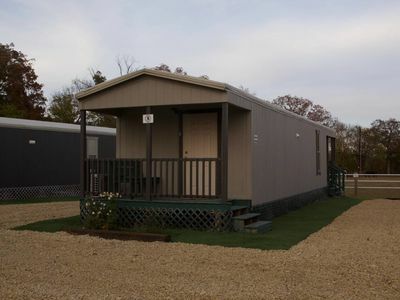 No trailers inside the community, but trailer parking is available in the field outside the gate. Sorry, but no exceptions to the 'No Pets Allowed' policy, it's per our Homeowner's Association. Waterfront Cabin, 'Lakeview Canoe' w Private Dock! VRBO Bear Stayed Here! 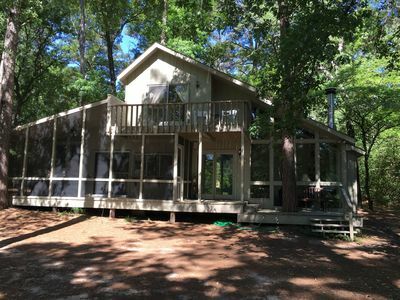 Escape the city and take in the best Lake Cypress Springs views from this renovated cabin! 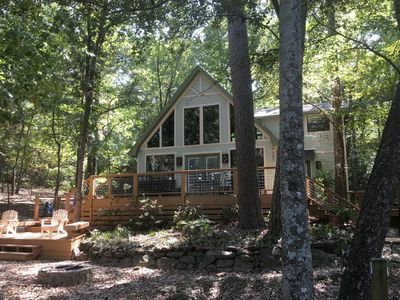 This 3 bedroom, 2 bathroom cabin sleeps 8 and is feels like you're in a treehouse nestled lakeside amongst huge pines. The open family room and kitchen area, with a real mounted canoe, has floor to ceiling windows allowing unobstructed views of the lake. 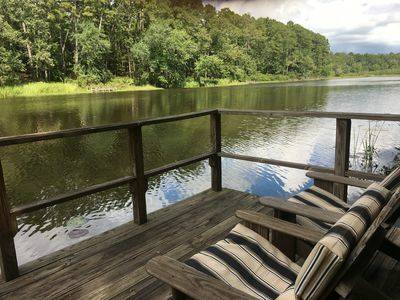 Just feet from the water, bring your water toys and fishing pole for hours of lake fun, relax on the private deck or dock and take in the views! The neighborhood just got a new road and driveways and linens are provided. Note: We also own the property next door, 'Camp Canoe', which sleeps 6; check out that listing (VRBO #1062646). The common areas on the main level include a new fully equipped kitchen with granite countertops, breakfast bar and a dining area. Also on the first floor is a family room with a flat screen TV with NFL Red Zone, two bedrooms with queen beds and a large remodeled bathroom with a washer and dryer. 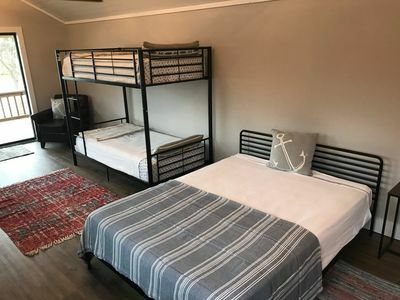 Upstairs, the huge bunk room, with new flooring, has two sets of built-in twin bunk beds withe new memory foam mattresses as well as a separate TV area and a remodeled bathroom with a tub. Just outside on the large deck with great water views is a patio table, bench seating and a charcoal barbecue grill. Two kayaks are available; a three person kayak and a youth kayak and several life jackets are provided. A fire pit (please bring firewood) with seating and a hammock are steps away on the lawn. Great swimming and fishing off the dock, or at the sandy community beach. Lots of open space for kids to run and explore. The fully renovated house has all new furniture and fixtures, fresh paint and a clean and modern, but cozy flair. A set of sheets will be on each bed to be made up upon your arrival. A housekeeping fee for cleaning the property after check-out will be included. Sorry, but per the Homeowner's Association Guidelines, pets are not allowed and we cannot make exceptions. Lake Cypress Springs was named by D Magazine as one of the “Best Kept Secrets” in Texas. At 3400 acres and 7 miles long, the spring-fed lake is located in the East Texas piney woods of Franklin County. It is situated between the towns of Mount Vernon, Winnsboro, Pittsburg, and Mount Pleasant. Sorry, there is nowhere to rent boats on the lake, nor do we rent the boat or jet ski on the dock. Only 90 minutes from Dallas, the property is easy to get to and is in the private, gated community of Barker Creek. Boat ramps are just minutes away to launch water toys, and the expansive private dock is ready for incredible fishing, fun swimming and equipped with a slip for your boat (25 feet long by 9 feet wide). 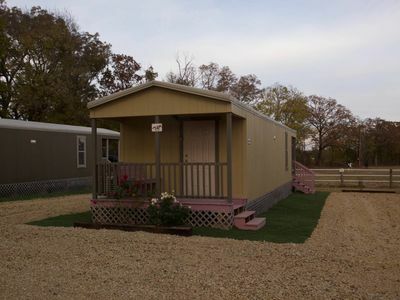 No trailers inside the community, but trailer parking is available in the field outside the gate. Sorry, but no exceptions to the 'No Pets Allowed', it's per our Homeowner's Association. 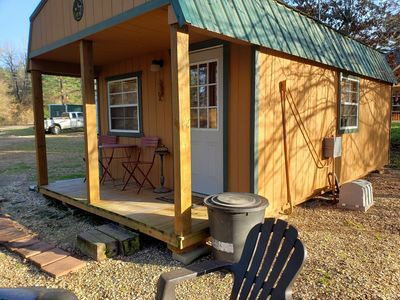 One of the only handful of rentals on Lake Cypress Springs, this 3 bedroom, 2 bathroom cabin sleeps 6. Well shaded waterfront house #4 is on the main part of the lake and approximately 150 feet from the water’s edge with a common boat dock. Our house has a large deck with table and 4 chairs for eating and 2 rocking chairs/gliders with a loveseat and fire pit. The house is fully furnished including dishwasher, stove, refrigerator & microwave. 3 bedrooms with Queen Size beds, 2 baths, Den/Kitchen w/fireplace. Washer and Dryer available upon request. There is a limit of 6 people including children. No visitors coming down for an hour or a day. Maximum house occupancies are designed for your comfort and our septic systems. Lake Cypress Springs, voted the most beautiful lake in Texas with over 3450 acres of pure, spring fed water and 42 miles of piney wood shoreline. The lake, is primarily a recreational lake, including kayaking, swimming, skiing and fishing with amply stocked black and large-mouth bass, trophy catfish and crappie. It is situated between the towns of Mount Vernon, Winnsboro, Pittsburg, and Mt. Pleasant. Only 90 minutes from Dallas, the property is easy to get to and is in the private, gated community of Barker Creek. Boat ramps are just minutes away to launch water toys. Sorry, but per the Homeowner's Association Guidelines, no pets are allowed. The Perfect Escape! Brand New, Beautiful Lake View Cabin with Boat Slip. Lake view cabin in a gated community on Lake Cypress Springs. Includes Boat Slip. The entire cabin has been newly remodeled. Nestled among towering trees with nice landscaping. Sleeps 6. Two bedrooms each have a queen size bed. Loft has two twin size daybeds. Dining room table seats six. Great lake views from the downstairs living room, dining room, kitchen, upstairs bedroom and loft. Two full bathrooms. Washer and dryer. Wrap around deck for outdoor relaxation. Grilling area on the side deck. The property is the perfect escape to enjoy lake living at it's best! First watch our story on Channel 8 ABC to see The Veranda in all its glory: https://www.youtube.com/watch?v=cEyZGThltlo Reunion, Anniversary, Wedding, Family Retreat or Couples Weekend - enjoy an entire compound! Originally a bed & breakfast - The Veranda is a glorious 1920’s Victorian Home (and accompanying bunkhouse) that served as the areas most posh, upscale B&B for many years. Wealthy patrons from Dallas with lake homes on the beautiful Lake Cypress Springs referred to the “Mansion of Mt. 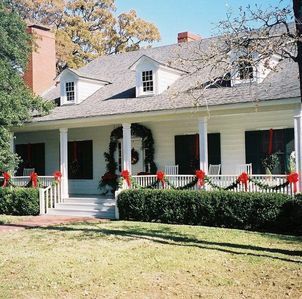 Vernon” as the finest dining and one of the most picturesque setting in East Texas. Having just undergone a $1m+ restoration, the retreat is a 120 acre paradise incorporating a sanctuary of rest and relaxation as well as activities galore. Originally envisioned and operated by Robert Whiteside & Warren Butler, new owners Mark and Kelly Bunting made cautious (yet significant) upgrades to this famous property during the 2010-2012 season. The result is a fabulous retreat true to original intentions of the earlier owners, yet greatly enhanced and expanded. Just 100 miles due East on I-30 from Dallas – this paradise of tranquility and peace feels more like 1000 miles away! Featured June 9, 2013 on ABC's Designing DFW segment (see video below). 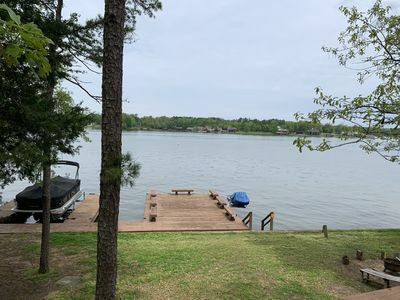 Situated on deep water frontage on Lake Bob Sandlin, newly remodeled 2 bed/2 bath home with open concept kitchen/living, screened porch, and boat dock with deck and slide. Gas grill and fire pit. Public boat ramp is 200 yards from house. 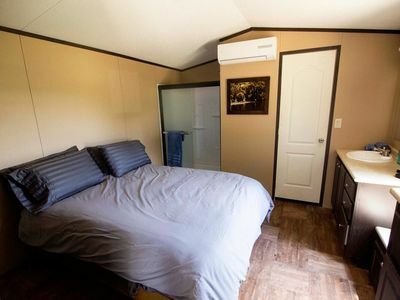 Beds - king in master, queen and full in 2nd bedroom, plus twin bunks Whether you are looking for somewhere to stay with your family, or a girls/guys weekend, this place is for you. 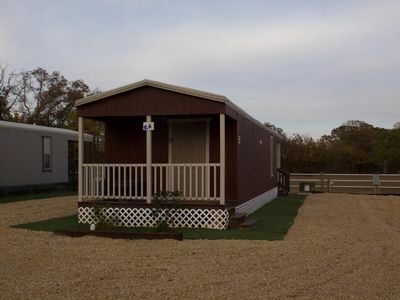 You will find a great view of the sunset, and fireworks from Lake Cypress on holidays. 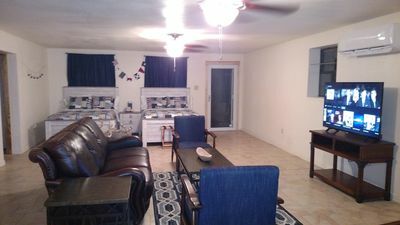 Includes linens, hair dryer, and coffee maker, appliances, washer and dryer, full kitchen. NON SMOKING Great lake for fishing, swimming and boating. 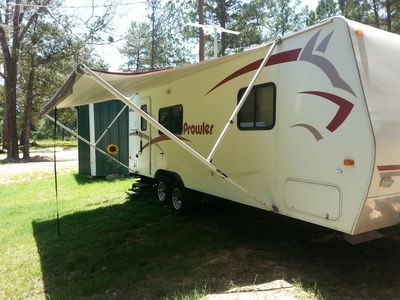 26 ft Fleetwood camper nestled among pine and oak trees, one slideout, sleeps 6, refrigerator/freezer, 3 burner stove, oven, lcd tv, all linens, towels etc. supplied. all kitchen utensils supplied, outside is bar-b-que grill and picnic table. only approx 100 yds to public boat ramp. Plenty of parking for vehicle and boat, outside plug in for boats. DVD player for your convenience. Seafood resturant nearby, bar-b-que and country store nearby. Check in after 1 PM, Check out 12 Noon. Unless previous arrangements made. We are located at #6 cr 2404, Pittsburg, Tx. Memorial Day weekend now available!! 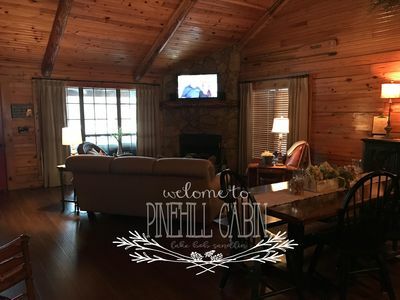 Welcome to Pinehill Cabin!!! 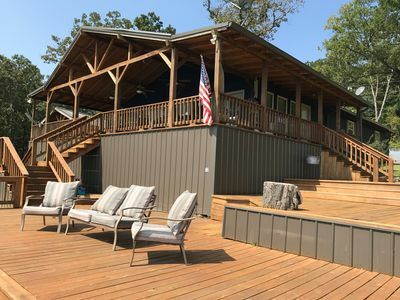 A perfect lakefront retreat less than 2 hours from the Meteroplex and Sherveport... Renovated (completed August 2016), Pinehill Cabin is a 1956 sq ft log home on beautiful Lake Bob Sandlin. 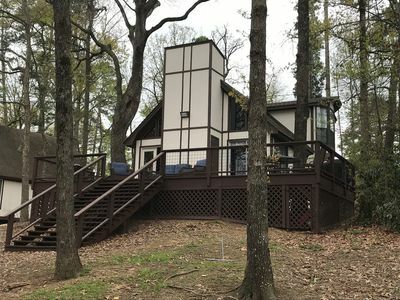 Whether it’s the amazing lake views, being surrounded by tall pine trees or the need for a quiet star filled night sky, the Piney Wood of East Texas is your perfect getaway. Beyond the majestic views of beautiful Lake Bob Sandlin, we have pridefully renovated every room of the log home with high end furnishings -- all thoughtfully designed with every detail in mind. Some of our renovation highlights are: Living room, kitchen and downstairs bedrooms have new 5” hand scraped hardwood flooring. KITCHEN Brand new 3cm granite, under mount sink, custom island with built in microwave and garbage, Kenmore pro stainless French door refrigerator with matching ceramic top range and dishwasher. All new lighting. Extensively stocked with high end cookware, glass and dishware. Brand new toaster, blender and waffle iron. Island seats 4 and farm table seats 8 LIVING ROOM New couch, rug and all furnishings. Flat screen tv installed over stone fireplace. Equipped with Direct TV. New ceiling fans w. remote controls. MASTER BEDROOM New iron king bed with Serta mattress. All linens, pillows and sheets are top quality and brand new. New reclaimed pine vanity in bath, toilet and tile floors. GUEST BEDROOM New iron Queen bed with high end new linens, sheets and pillows. New tile, toilet and vanity in en-suite bath. KIDS OPEN LOFT Two New iron trundle twin beds with linens sheets and pillows. Equipped with a flat screen tv with DIRECTV and Xbox 360. The cabin is perfect for a two family share. It comfortably sleeps 8. Arrangements include two bedrooms downstairs (king and queen), 2 bathrooms both en-suite. The “kids” loft upstairs looks over the main living area and is furnished with two iron twin trundles. There’s beautiful lake views from all bedrooms. There is also a laundry room equipped with a full size washer and dryer, iron and ironing board. The back porch will quickly be your favorite place with its panoramic lake views. Enjoy your morning coffee or an evening refreshment as you take in the beautiful sunset from either a deep seating area and or the dining area. The lower deck has a six seater granite top umbrella table. Additionally, there’s a charcoal Weber grill and a chimenia. We have some wood at the front of the house for your use, but can’t guarantee how much will be there. Pinehill additionally offers a lakeside firepit with 6 Adirondack chairs for your comfort...perfect to enjoy the beautiful Bob Sandlin sunsets..and of course s'mores!!! As you make your way to the lake the house has a boat dock, perfect for pier fishing and availability to tether your boat to the dock(you can access our private lake boat ramp at the end of the street). If additional bedrooms are needed our neighbors 2 doors down rent out their finished loft above the garage as well. Rates and photos available upon request. 12 x 24 lofted cabin, with 2 full size bunk beds, 1 queen size bed. (All linen provided) kitchen with microwave and new wave cook top, refrigerator / freezer. All cookware and eating utensils provided. Coffee pot with complimentary coffee sugar and creamer provided. Full size bathroom with towels and toiletries provided, dvd for your convenience. Public boat ramp within 100 yards. stores and eateries nearby. only 12 miles from Mt Pleasant and 7 miles from Pittsburg texas. Come and kick back and relax. Check in 1pm, Check out 12 Noon unless previous arrangements made. We are located at #6 cr 2404, Pittsburg,Tx. Great place to relax and enjoy the lake. Gorgeous views. Nice fishing pier. Home sits just off the open water but still has the view of it. Large deck on lake side of the house that features an outdoor TV, large table, and patio furniture. Build a fire down by the lake and enjoy the outdoors. The home has 3 bedrooms and a sofa bed so you can sleep 8 comfortably. The kitchen has a breakfast bar, coffee station with a Keurig coffee maker, and is open to the living room. There is a gas grill if you decide you want to grill up some dinner. Located just a little over 2 hours from Dallas, Texas or Shreveport, LA, Three Cedars Lodge offers you a getaway from the “busy”ness of the big city that you can easily do on a weekend! We are located on Lake Bob Sandlin in Pittsburg, TX. Three Cedars Lodge provides a comfortable cabin / lake house nestled amongst cedars, pines and all kinds of nature. Experience God’s best at Three Cedars Lodge! Want to get away? Contact us! 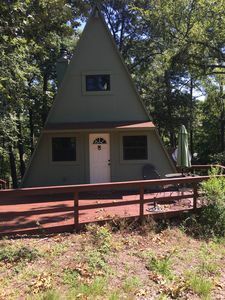 Cozy A-Frame on Beautiful Lake Bob Sandlin, Pittsburg Texas. This three level A-Frame has everything you need for a great family getaway or a fishing trip with friends. It sleeps 7 comfortably with three twin beds, one queen bed and a queen sleeper sofa. There are two additional air mattresses that may be used. The cabin has two full baths with showers and one half bath. 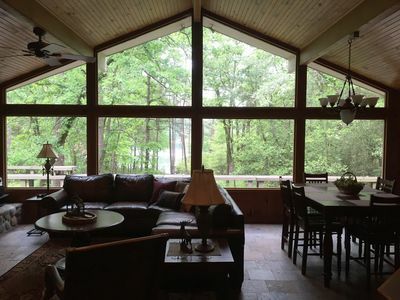 There is a large front deck and a back deck overlooking the lake, nestled in the woods. Back deck has a fire pit and charcoal grill. Amenities include electric range, refrigerator, microwave, washer, dryer, fireplace, central air/heat. 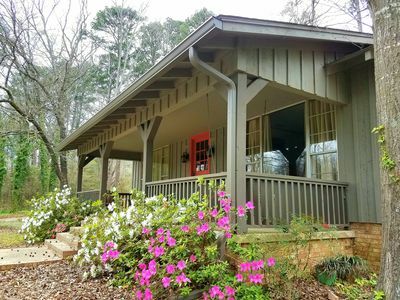 Charming 2 Bedroom Cabin located on a beautiful 25 acre ranch. Cabin is cozy clean and comfortable. Tastefully decorated with reclaimed materials from a 100 year old farm house. Cabin is equipped with air-conditioning and heating, full kitchen, bathroom with shower, WIFI,TV/ DVD. Watch the sunrise or sunset from your private back porch, or sit around your own fire pit in the front. Plenty of parking for RV and Boat. Full access to ranch including private fishing hole stocked with BlueGill and Catfish. Looking to get away for the weekend, enjoy fishing at one of 5 area lakes (minutes from Lake Fork), or just need a quite place to recharge, you won't be disappointed. It’s time to relax on the 9,400 acre lake just 4 miles west of Pittsburg, Texas on the south side of Lake Bob Sandlin. This waterfront property is nestled on a relatively secluded, stunningly landscaped 2.92 acres, boasting 3 bedrooms each with queen beds and an additional private office, 2 full baths and an oversized 2 car garage. The boat house features two cradle lifts for your Lake toys. Kitchen is equipped with everything needed including new microwave, coffee maker, toaster, dishes, pots and pans. Outside deck has a charcoal grill and beautiful views of the lake. Pier for fishing or swimming, fishing poles included. Pets are more than welcome outside and in the garage. Please no pets or smoking inside the house. There is 12 local channels available on the TV but no internet. Hot spots seem to work fine and we have provided a few movies. Unplug and roast some marshmallows in the fire (fire pit and roasting sticks provided). 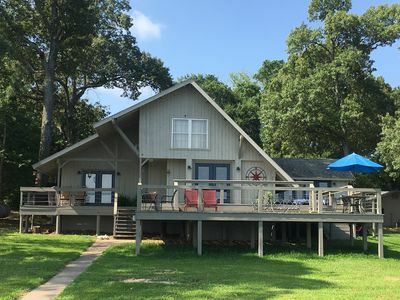 **15% discount for 7+ nights / 30% discount for 28+ nights** Lake Bob Sandlin is very unique for Texas in that it is connected to Cypress Springs Lake and Lake Monticello by earth dams and offers fabulous fishing and boating fun! Just two miles up the road is the fabulous Barefoot Bay Marina for all your essentials, bar, and entertainment. Pittsburg offers nature trails, historical markers and homes, museums, a quaint Main street, and antique shops including a 9-hole "Princedale" course at the Princedale Golf Club facility featuring 2,858 yards of golf from the longest tees for a par of 36 . The course rating is 25.0 and it has a slope rating of 113. Princedale golf course opened in 1928 and welcomes visitors if no tournament is scheduled. Los Pinos Winery offers live Jazz every Friday and Saturday evening and a beautiful scenery! 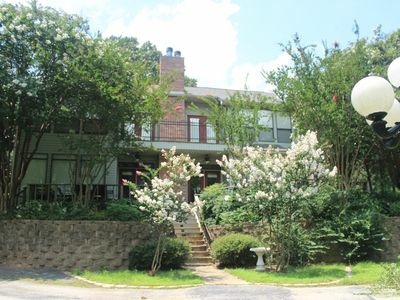 Perfect Winnsboro Family Home-Walk to Main Street! Pittsburg Family House on Lake Bob Sandlin w/Dock! Pittsburg's Art and Wine Festival! Fantastic getaway from the hustle and bustle of the city. 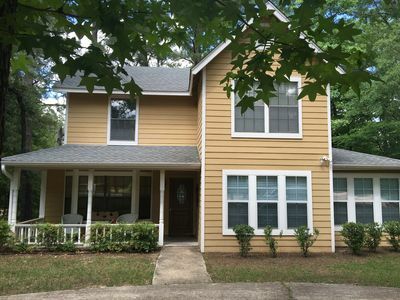 Kid and pet friendly, newly and completely renovated house on Lake Bob Sandlin. 15 minute drive to an intimate, highly rated winery outside Pittsburg. Many lake activities available. A great spot to host family & friends or just a quiet, relaxing oasis. Guide service for fishing available upon request as well. The Space: 3BR - 2BA - all bedrooms equipped with king beds and master includes walk-in shower. Kitchen and living room is an open concept and has brand new appliances(fridge, oven/washer/dryer). Renovated kitchen is equipped with everything needed. Outdoor space includes brand new 50X10 deck, with lounge chairs and incredible views of the lake. Grill also available. Pier for fishing, swimming, or just a relaxing glass of wine. WIFI and DISH Network. Interaction with Guests: We interact with guest as little or as much as they prefer. Homemade cookies and drinks upon your arrival? Also - ask about the option to have an authentic southern meal, catered by the host. We are available via phone or text so we can meet all of your needs and even spoil you a little ;). Guest Access: Guests are welcome to use anything outside or inside. We greatly believe in southern hospitality and want nothing more than for you and your family or friends to feel right at home. Area: House is at end of a cul de sac. Neighborhood is great for walks or cruising around in your golf cart. Minutes from the local marina if you need to grab a few necessities or listen to a live band on the weekends. Dogs are allowed, but please contact host in advance as there are breed restrictions. Other Items to Note: No smoking. No parties. Uber not available, but small taxi in town. Plenty of parking. 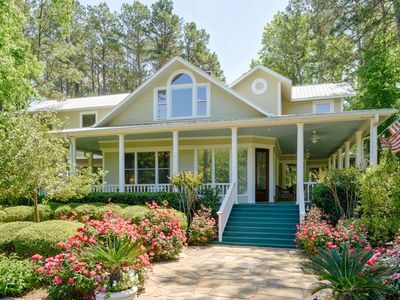 Leave behind your daily stress and soak up small-town charm in a gracious Southern home. You will be 2 minutes from shopping, museums, restaurants, and beautiful parks in the soon to be designated National Register Historic District of Mount Vernon, Texas. Just 7 miles south of town is Lake Cypress Springs which has been named the Prettiest Lake in Texas! Stroll our streets and visit our shops or enjoy a picnic in the Gazebo on the square. Breathe! Private bedrooms and bath including one queen sized bed and two double beds. NEW! 4BR Saltillo Ranch Home w/Pool & Event Space! Fully furnished cottage in the woods with backyard opening to pine trees and four acre pond. Cottage has wood floors, window air conditioners and homey furnishings. Perfect for a family retreat or a romantic getaway. Located on our 130 acre working ranch, Pine Grove Cottage is tucked away on its own corner of the property with private drive and gated entrance. A sun room runs the length of the house in the back and looks out on the pine grove and lake beyond. An open family room/dining/kitchen is perfect for family gatherings. Guests are free to roam the ranch property which includes several small lakes (four to seven acres in size) and large expanses of wooded acreage where wildlife and birds abound. Fishing on the lakes is available on a "catch and release" basis to ensure fishing remains good for future guests. Lakes are stocked with bass, catfish and bream. Canoes and boats are provided for those who want to go out on the lakes to fish or just relax. Located within 15 minutes of Pittsburg, Gilmer, and Winnsboro, guests can experience life in the country but enjoy the amenities of a town. In the summer, fresh peaches, blackberries and blueberries are sold at nearby orchards. Golfing, a winery and a variety of restaurants are within 15 minutes of the ranch. For those who enjoy antiques, there are many shops within 15-30 minutes of the ranch. NEW! ‘Tuscan Cottage’ Pittsburg Studio on Winery! Welcome to The Lake House! This family friendly waterfront property offers something for everyone's interest. Located just 90 minutes east of Dallas you can expect the fresh outdoor breeze with panoramic waterfront scenery upon your arrival. Your boat is just waiting to be launched at the nearby boat ramp for a day of water fun! After a day of relaxing enjoy the sunrise and catch the "BIG" one on Lake Forks famous trophy bass waters just a short 12 minute drive away. Settle down for the night and tell you fishing tales at the outdoor seating area with fire pit or on the balcony seating. Visit quaint small town shopping in Mineola and Winnsboro or do nothing but nap and read in the hammock. Too tired to cook?...Just walk on over to the Marina Restaurant (open in summer months) that offers a full menu and is the locals favorite! The Marina now offers ice and gas for your boat on the semi-private waters of Lake Quitman and is convienent to fill up before a day of fishing on Lake Fork! With 4 bedrooms and 2 1/2 baths this retreat offers plenty of space for friends and family. The Lake House features an open concept living and kitchen area with upscale granite countertops, a 6 burner stove, and a beautiful farmhouse oak table with seating for 8 fit for a full meal or domino tournament. The downstairs master suite offers a queen bed, comfortable glider and armoire for storage. The luxurious master bath has a large walk in shower and dual shower head. The downstairs guest bedroom has french doors displaying the lake view that open up to inviting rocking chairs on the covered back porch. This room has a queen bed and is accommodated with a large closet and armoie to stoy away luggage for a total lake escape. 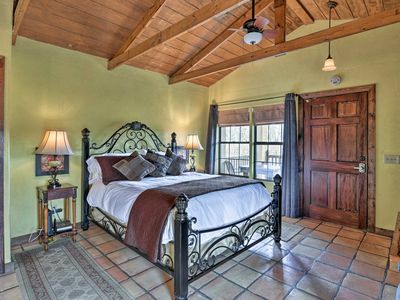 The upstairs guest bedroom offers a plush king bed, vaulted ceilings and breathtaking lake views. The upstairs bathroom is complete with a walk in shower and continues to another guest bedroom with 2 queens, 1 full and 1 set of bunk beds perfect for late night movies.This home is perfectly designed for space for everyone, fun and relaxation! Adventure awaits your arrival at The Lakehouse! 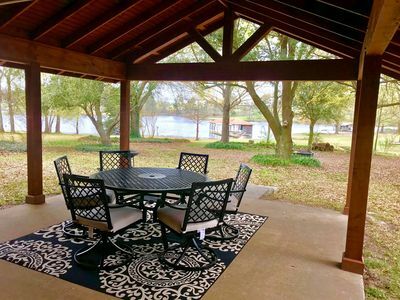 This Lakefront getaway you have been looking for on beautiful Lake Quitman! Just 1 hr and 45 min from the heart of Dallas. Best view on the lake. You will feel right at home with a spacious cabin and breathtaking sunsets. 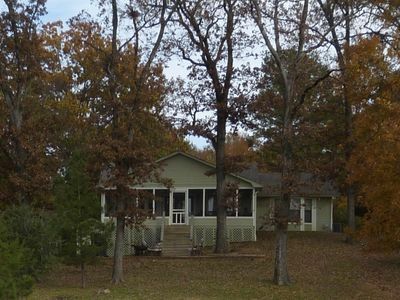 Perfect place to stay while fishing on Lake Fork, quiet personal get away, couples or family retreat. Bring your boat and fishing gear! Come enjoy some sun and relax! Go for a swim! Looking to relax & get away with your family or friends? Tournament on Lake Fork? Come stay at Paradise Cove Lake House on beautiful Lake Quitman! Located 1 hour and 45 minutes east of Dallas, this premier lake property has 100 feet of waterfront with an open view, sandy shoreline and not in an area of choppy waters so you can dock up your boat or jet skis overnight. One of the unique features of this property is we have a beach area. We have brought in sand over the years so you can walk into the water. And, not to worry, you can still do cannonballs off the end of the dock! Another unique feature is our large dock with room to sun & fish but also a covered area for dining and shade. In the Summer, your group will appreciate the covered dock with fan to take a break from the sun. While our home is less then 1,800 SF, the back porch is where you will eat, drink and enjoy the view the entire weekend! It has two large rockers, two loungers, conversation set with love seat & dining table. It is completely covered and has porch fans! Kitchen features stainless appliances and stocked kitchen including a Kuerig to enjoy your morning coffee on the deck. The sun room bar is used to serve food for larger groups. Guest bath has a tiled tub/shower combo and linen closet filled with bath towels (and even some extra beach towels if you forget your own). Master bath has a large stand up tile shower. Utility room has a washer/dryer and ice machine. There is no internet and this is intentional. This gives everyone a chance to unplug and enjoy the lake life. We do have cable television, 2 televisions with DVD players, one in Master bedroom and one in Living room. Main house has 3 bedrooms and 2 bathrooms, sleeping up to 8 adults plus bunks for children. Bunk house sleeps an additional 4 guests and has a full Bath. Accomodations: Main House Master- King Bed Guest- 2 Queen Beds Guest - 1 Queen Bed Hallway- Twin Bunkbeds Extra: futon in master Bunk House: Queen & Twin Bunkbeds *Reduced rate for 4 or less guests or in January & February, please request quote. **Bunk House is also listed as a separate rental on VRBO. Bunk House will be made available and is included for groups exceeding 10. For groups less then 10, please message if you wish to add the bunk house to your booking. Thank you! 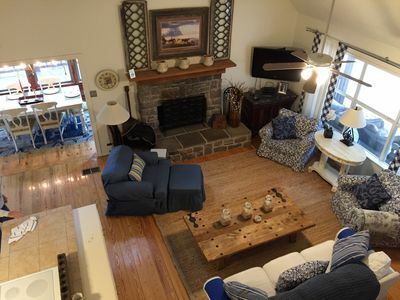 Groups are sure to enjoy a memorable vacation in this fully furnished, 6 bedroom / 5 bath lake house with large game room and 3 living areas that are ideal for large groups. 90 minutes drive from Dallas area. The 1.5 acres of lake front property has a dedicated private boat ramp - guests can bring a boats with space for boat trailers and trucks. 2nd level of boat house ideal for relaxing and enjoying views of the lake and fishing. There is one bay of the boat house available for guest use. Boats can be taken in and out at private boat ramp. Game room with table tennis, darts, Foosball and outdoor putting green will cater to those who are looking to be active. Expansive kitchen and fully stocked with everything your group will need. ^ bedrooms total - 3 bedrooms have king sized beds with additional bedrooms with queen bed, full beds and bunk beds. Spend the day away, enjoying nearby attractions around lake fork and in nearby Sulphur Springs. Note July 1st 2019 - check in time will change to 3pm and check out time will change to 10am. Please ask about late checkout options and charges. Will accommodate based on availability. Our Bunk House is located next to our main house in Paradise Cove on Lake Quitman. It is perfect for couples, solo travelers, or fishermen. While it is set up more like a hotel with a mini-frig, coffee maker & a motel hvac unit (heats & cools), but unlike a hotel you have use of our amazing dock for relaxing or fishing! We completely remodeled it with new flooring, large bathroom with custom vanity and vessel sink. Queen bed & metal bunk beds will hold most adults. There is electricity on the porch if you wish to bring your portable grill and plenty of parking for your boat! Upon booking I can send recommendations for fishing guides on Lake Fork, and places nearby to assist you during your stay. 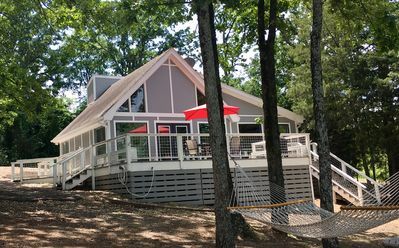 The main house Paradise Cove Lake House VRBO # 1148718 sleeps 10 and can be combined with this listing. Contact me direct for rate for both listings. Fully Furnished Lake Fork Waterfront Property with Boat House! Under New Management!! Welcome to a WONDERFULLY furnished house located on the main water of Lake Fork, one of the best bass fishing lakes in the US. You will enjoy the beautiful trees and the quietness that only the country can bring. Bring the doggies along too. There is a large back yard with a fence for them to run around in. The house is located only 2 doors down from a public boat ramp which makes it convenient to drop your boat in the water and take it to the boat house for the weekend. If you have children that would like to try fishing you might not want to let one of Lake Fork's most untapped resources pass you by...CATFISH! If you would like to set up a guided fishing trip, whether it would be chasing one of the many record bass that Lake Fork can produce or loading the boat up with catfish or crappie for a fish fry, we can assist you to the right guide for one of the best trips you could ever have! For those who have time to stay a few days during hunting season, you won't want to miss out on a good duck or deer hunt. Guides are available for those too! Skeeter and McDonald's tournament rates are $200 per night for 2 people and $20 each additional person with a 4 day minimum. If you try to book these days at regular rates I will send the correct invoice. NOTE: Lake levels great and boat house is operational! 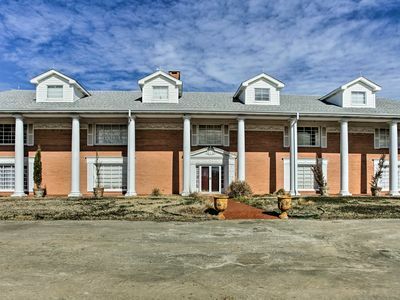 The Walker Family lake house is a beautiful two story brick lakefront property located on the shores of world renowned Lake Fork. The surroundings are very private and quiet. The house comes fully furnished with all the amenities anyone would need for a weekend stay or a weeklong vacation. There is plenty of outdoor space and a great view of the lake. In fact, the sunsets are many times breathtaking! The boat dock has been updated and is equipped with a boat lift and a large sitting area to enjoy the sunsets. Electricity of course is available for charging your boat batteries after a long day of fishing. Many times the deer make a showing at the feeder and a lot of other wildlife show up as well. We have some resident wild ducks who make a morning showing at the deer feeder nearly every morning. They are fun to watch & it is definitely relaxing to say the least. 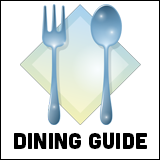 There are also a lot of restaurants available nearby as well if you choose to dine out. Also if you are a First Monday fan, Canton Texas is located about 45 minutes from the lake house. A lot of families come on First Monday weekend and the guys go fishing while the ladies go shopping! No kidding...Your gonna love the Walker Family Lake house. I know we sure do! 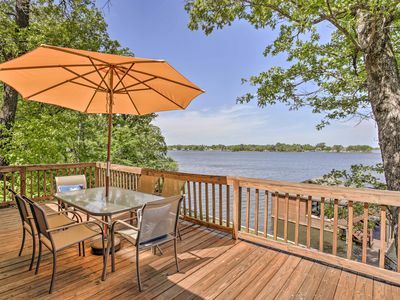 Like New cedar Lake House on Lake Fork, House on STILTS, Fishermen's haven or getaway for family reunions, corporate meetings, girl get togethers, groups, vacation at Lake Fork, Water View, Sleeps 12, 2 and a half baths. 2 large decks 1 completely screened top to bottom, 2 Queen with memory foam mattresses, 8 bunks, 8 ceiling fans, hammock fully furnished kitchen, MW, DW, range, Ref/Freezer, granite counter tops, hardwood floors, washer/dryer, all linens included, soap's etc. This is a home away from home. Need a fishing guide, we can schedule with one of the top guides at Lake Fork, contact Bill Sweeten. Keywords: waterfront, waterview, lake fork, lake house, beach house, 4 bedrooms, lake access, fully furnished, commercial aerobic septic system, Extra large water heater. Located just 3 minutes from the public boat ramp on Lake Fork (Hwy. 154), you will find Stable View Cottages. Cabin 2 is a tiny home providing all of the amenities you need for a trip to the lake. You'll also be able to enjoy the beauty of our horse farm from the back porch. Ask about our horseback riding, horse boarding and farm fresh eggs! 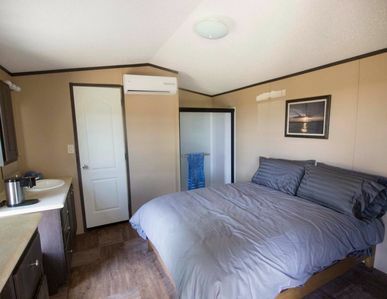 The Space: Each tiny home features a large master bedroom with queen size bed, bathroom, kitchen with full size refrigerator, microwave and two burner cooktop. The living room features a full size futon, smart TV with Netflix and dining table. Each tiny home includes a front and back porch with grill. Boat parking is available alongside the cabin with electric access for charging. Free WiFi. Guest Access: Boat parking is available on the right side of the cabin with an ample 20 foot clearance and access to electricity. Guests can also enjoy our fire pit. Interaction with Guests: We use a "self check-in" procedure. Simply show up and a lock box will be located next to the door with the key. Code provided prior to your arrival. The Neighborhood: Lake Fork is well-known for it’s bass fishing and Stable View Cottages is located just 3 minutes from the public boat ramp, marinas and several restaurants. Our cottages sit adjacent to our stables, allowing for a unique equine experience as well. The Sabine River Authority Day Use area and the public boat ramp both offer fishing piers for guests without a boat. Getting Around: Please note that GPS will take you down the county road adjacent to the cabins. Do not turn down this road as access to the cabins is located directly off of Hwy. 154. The small town of Yantis is located just 10 minutes away and offers a great pizza restaurant, gas station, laundromat and Dollar General. The Crossroads gas station also has some necessities as well as a full bait shop. Other Things to Note: We also offer fresh farm eggs, horse treats, horseback riding and souvenir t-shirts for purchase! Overnight horse boarding is also available. Pet friendly with fee. Contact for more information. House Rules: No smoking No parties or events Check-in is anytime after 3PM This reservation has a Firm cancellation policy - refunds will be issued up to 60 days prior to the check in date. A 100% refund is provided for travellers cancelling at least 60 days before check-in. A 50% refund of the rental amount is provided for travellers cancelling from 30 to 59 days before check-in. No refunds are provided for travellers cancelling less than 30 days prior to check-in. Our house rules: no smoking, no parties or events, pets permitted. Enjoy a cozy room at Stable View Cottages and have access to all the Lake Fork has to offer just outside your door step. We are conveniently located just 3 minutes away from the public boat ramp on Hwy 154, several marinas and more. We also offer a unique equine experience right outside, as we are adjacent to Lake Fork Stables. The Space: Room 1B at Stable View Cottages offers all of the necessities you need for a stay at the lake. This room is a "hotel" style room with the basics. It includes a walk in shower as well as private bathroom with closet and desk space. Coffee maker, mini-fridge and smart TV with Netflix included as well as WiFi. Guest Access: Boat parking may be limited due to the positioning of the building. Additional boat parking with electricity is provided at the end of the property in these instances. Guests can also enjoy our fire pit with grill top. Interaction with Guests: We offer self check-in. Upon arrival you will find a lock box by the door with your key. The code will be provided prior to your arrival. The Neighborhood: Stable View Cottages is located on Tx. Hwy. 154 and are just minutes away from boat ramps, marinas, and several restaurants. You can also enjoy the opportunity to interact with the resident horses adjacent to the cabins. Getting Around: Please note that GPS will take you down the county road adjacent to the cabins. Do not turn down this road as access to the cabins is located directly off of Hwy. 154. The small town of Yantis is located just 10 minutes away and offers a great pizza restaurant, gas station, laundromat and Dollar General. The Crossroads gas station also has some necessities as well as a full bait shop. Other Things to Note: We also offer horse treats, horseback riding and souvenir t-shirts for purchase! Overnight horse boarding is also available. Contact for more information. House Rules: Not suitable for children and infants No smoking No parties or events Check-in is anytime after 3PM This reservation has a Firm cancellation policy - refunds will be issued up to 60 days prior to the check in date. A 100% refund is provided for travellers cancelling at least 60 days before check-in. A 50% refund of the rental amount is provided for travellers cancelling from 30 to 59 days before check-in. No refunds are provided for travellers cancelling less than 30 days prior to check-in. Our house rules: no smoking, no parties or events, pets permitted. Stable View Cottages Cabin 6 is located conveniently off of TX Hwy. 154 and is just minutes from the public boat ramp on Lake Fork. Our back porch provides a relaxing view of our equestrian facility, as well as a grill and outside seating. Inside, you will find a queen size bed in the bedroom. The living room features a super comfortable futon and breakfast table with Smart TV. The kitchen includes a refrigerator and two burner stove top, microwave, coffee maker and toaster. The Space: Each tiny home features a large master bedroom, bathroom, kitchen with full size refrigerator, microwave and two burner cooktop. The living room features a full size futon, TV and dining table. Each tiny home includes a front and back porch with grill. Guest Access: Boat parking with electricity is available alongside the cabin. Guests can also enjoy our fire pit with grill top. Interaction with Guests: We use a "self check-in" procedure. Simply show up and a lock box will be located next to the door with the key. Code provided prior to your arrival. The Neighborhood: We are located just 10 minutes from Yantis, where you will find a pizza shop, gas station, laundromat, and Dollar General. We are also just minutes from the public boat ramp and several marinas. The Crossroads gas station just minutes away has a full bait shop. Getting Around: Please note that GPS will take you down the county road adjacent to the cabins. Do not turn down this road as access to the cabins is located directly off of Hwy. 154. The small town of Yantis is located just 10 minutes away and offers a great pizza restaurant, gas station, laundromat and Dollar General. The Crossroads gas station also has some necessities as well as a full bait shop. Other Things to Note: We also offer fresh farm eggs, horse treats, horseback riding and souvenir t-shirts for purchase! Overnight horse boarding is also available. Contact for more information. House Rules: No parties or events Check-in is anytime after 3PM This reservation has a Firm cancellation policy - refunds will be issued up to 60 days prior to the check in date. A 100% refund is provided for travellers cancelling at least 60 days before check-in. A 50% refund of the rental amount is provided for travellers cancelling from 30 to 59 days before check-in. No refunds are provided for travellers cancelling less than 30 days prior to check-in. Our house rules: no smoking, no parties or events, pets permitted. Stable View Cottages is located just 3 minutes from the private boat ramp on TX Hwy. 154, making it convenient for fisherman and travelers alike. 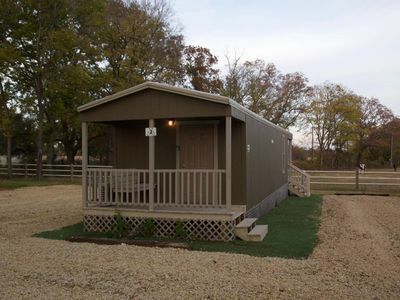 Our cabins back up to Lake Fork Stables, our equestrian facility, and guests will be able to view the horses from the back porch as well as interact with them over the fence. The cabin features a kitchen, full refrigerator, and all of the necessities for a stay at the lake. The Space: Each tiny home features a large master bedroom, bathroom, kitchen with full size refrigerator, microwave and two burner cooktop. The living room features a full size futon, TV and dining table. Each tiny home includes a front and back porch with grill. Guest Access: Guests can use our fire pit. Boat parking with electricity is available. The Neighborhood: We are located just 10 minutes from Yantis, where you will find a pizza shop, gas station, laundromat, and Dollar General. We are also just minutes from the public boat ramp and several marinas. The Crossroads gas station just minutes away has a full bait shop. Getting Around: Please note that GPS will take you down the county road adjacent to the cabins. Do not turn down this road as access to the cabins is located directly off of Hwy. 154. The small town of Yantis is located just 10 minutes away and offers a great pizza restaurant, gas station, laundromat and Dollar General. The Crossroads gas station also has some necessities as well as a full bait shop. Other Things to Note: We are located just 10 minutes from Yantis, where you will find a pizza shop, gas station, laundromat, and Dollar General. We are also just minutes from the public boat ramp and several marinas. The Crossroads gas station just minutes away has a full bait shop. House Rules: No smoking No parties or events Check-in is anytime after 3PM This reservation has a Firm cancellation policy - refunds will be issued up to 60 days prior to the check in date. A 100% refund is provided for travellers cancelling at least 60 days before check-in. A 50% refund of the rental amount is provided for travellers cancelling from 30 to 59 days before check-in. No refunds are provided for travellers cancelling less than 30 days prior to check-in. Our house rules: no smoking, no parties or events, pets permitted. 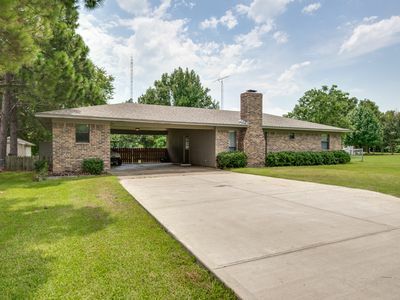 Located just 3 minutes from the public boat ramp on Lake Fork (Hwy. 154), you will find Stable View Cottages. Cabin 4 is a tiny home providing all of the amenities you need for a trip to the lake. You'll also be able to enjoy the beauty of our equine facility from the back porch. The Space: Each tiny home features a large master bedroom, bathroom, kitchen with full size refrigerator, microwave and two burner cooktop. The living room features a full size futon, TV and dining table. Each tiny home includes a front and back porch with grill. Guest Access: Guests can also use the fire pit. Boat parking with electricity is available. Interaction with Guests: We use a "self check-in" procedure. Simply show up and a lock box will be located next to the door with the key. Code provided prior to your arrival. The Neighborhood: We are located just 10 minutes from Yantis, where you will find a pizza shop, gas station, laundromat, and Dollar General. We are also just minutes from the public boat ramp and several marinas. The Crossroads gas station just minutes away has a full bait shop. Getting Around: We are located just 10 minutes from Yantis, where you will find a pizza shop, gas station, laundromat, and Dollar General. We are also just minutes from the public boat ramp and several marinas. The Crossroads gas station just minutes away has a full bait shop. Other Things to Note: We also offer fresh farm eggs, horse treats, horseback riding and souvenir t-shirts for purchase! Overnight horse boarding is also available. Contact for more information. House Rules: No smoking No parties or events Check-in is anytime after 3PM This reservation has a Firm cancellation policy - refunds will be issued up to 60 days prior to the check in date. A 100% refund is provided for travellers cancelling at least 60 days before check-in. A 50% refund of the rental amount is provided for travellers cancelling from 30 to 59 days before check-in. No refunds are provided for travellers cancelling less than 30 days prior to check-in. Our house rules: no smoking, no parties or events, pets permitted. Stable View Cottages Cabin 2 is located conveniently off of TX Hwy. 154 and is just minutes from the public boat ramp on Lake Fork. Our back porch provides a relaxing view of our equestrian facility, as well as a charcoal grill and outside seating. Inside, you will find a queen size bed in the bedroom with ample storage space. The living room features a super comfortable futon and breakfast table with Smart TV. The kitchen includes a full refrigerator and two burner stove top, microwave, coffee maker and toaster. Enjoy our close proximity to Lake Fork and the horses will be happy to see you! Ask about fresh farm eggs, horseback riding, and souvenir t-shirts! The Space: Lake Fork is well-known for it’s bass fishing and Stable View Cottages is located just 3 minutes from the public boat ramp, marinas and several restaurants. Our cottages sit adjacent to our stables, allowing for a unique equine experience as well. Guest Access: Boat parking with electricity is available alongside the cabin on the right of the building. Guests may also enjoy our fire pit. Interaction with Guests: We use a "self check-in" procedure. Simply show up and a lock box will be located next to the door with the key. Code provided prior to your arrival. The Neighborhood: We are located just 10 minutes from Yantis, where you will find a pizza shop, gas station, laundromat, and Dollar General. We are also just minutes from the public boat ramp and several marinas. The Crossroads gas station just minutes away has a full bait shop. Getting Around: Please note that GPS will take you down the county road adjacent to the cabins. Do not turn down this road as access to the cabins is located directly off of Hwy. 154. The small town of Yantis is located just 10 minutes away and offers a great pizza restaurant, gas station, laundromat and Dollar General. The Crossroads gas station also has some necessities as well as a full bait shop. Other Things to Note: We also offer fresh farm eggs, horse treats, horseback riding and souvenir t-shirts for purchase! Overnight horse boarding is also available. Contact for more information. House Rules: Not suitable for infants (under 2 years) No smoking No parties or events Check-in is anytime after 3PM This reservation has a Firm cancellation policy - refunds will be issued up to 60 days prior to the check in date. A 100% refund is provided for travellers cancelling at least 60 days before check-in. A 50% refund of the rental amount is provided for travellers cancelling from 30 to 59 days before check-in. No refunds are provided for travellers cancelling less than 30 days prior to check-in. Our house rules: no smoking, no parties or events, pets permitted. Located just three minutes from the public boat ramp on Lake Fork (Hwy. 154), you will find Stable View Cottages. Room 1A is a "hotel" room providing all of the amenities you need for a trip to the lake. Guests will have a private room with bathroom, shower, vanity, mini fridge and desk area. The room also includes a Smart TV with access to the Internet for Netflix, Amazon Prime, etc., as well as a coffee maker. You'll also be able to enjoy the beauty of our equestrian facility located on the adjacent property. The Space: Stable View Cottages offers two options for guests to enjoy at Lake Fork. 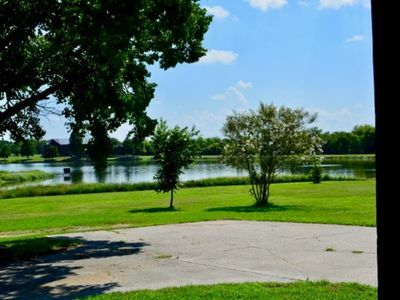 We are located just minutes from the private boat ramp and sit adjacent to Lake Fork Stables. Guest Access: Boat parking may be limited due to the positioning of the building. Additional boat parking with electricity is provided at the end of the property in these instances. Guests can also enjoy our fire pit with grill top. Interaction with Guests: We use a "self check-in" procedure. Simply show up and a lock box will be located next to the door with the key. Code provided prior to your arrival. The Neighborhood: We are conveniently located off of Texas Hwy. 154 in Yantis. The public boat ramp as well as several marinas are located just three minutes away. There are several restaurants in the area as well as laundromats. Getting Around: Please note that GPS will take you down the county road adjacent to the cabins. Do not turn down this road as access to the cabins is located directly off of Hwy. 154. The small town of Yantis is located just 10 minutes away and offers a great pizza restaurant, gas station, laundromat and Dollar General. The Crossroads gas station also has some necessities as well as a full bait shop. Other Things to Note: We also offer horse treats, horseback riding and souvenir t-shirts for purchase! Overnight horse boarding is also available. Contact for more information. House Rules: Not suitable for children and infants No smoking No parties or events Check-in is anytime after 3PM This reservation has a Firm cancellation policy - refunds will be issued up to 60 days prior to the check in date. A 100% refund is provided for travellers cancelling at least 60 days before check-in. A 50% refund of the rental amount is provided for travellers cancelling from 30 to 59 days before check-in. No refunds are provided for travellers cancelling less than 30 days prior to check-in. Our house rules: no smoking, no parties or events, pets permitted. 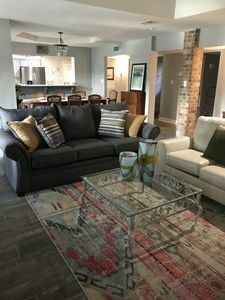 Peace & Quiet Cottage is a two-bedroom, one- & a-half-bath, fully furnished house, situated on 3 acres, directly next door to Pine Mills Pottery, in NE Texas, less than 2 hours from Dallas. It is located less than an hour from Canton First Monday (45 minutes), Lake Fork fishing (20 minutes), Tiger Creek Big Cat Refuge (25 minutes), Tyler Rose Gardens and Azalea Trails (45 minutes). Peace and Quiet Cottage is located where the Central Flyway and the Mississippi Flyway converge, so it is a haven for birdwatchers. If you love handmade pottery, it is located next door to Pine Mills Pottery, the working ceramic studio and gallery of Daphne and Gary Hatcher. Perfect for small reunion groups, couples, naturalists, a private writers or artist retreat, a yoga retreat, birdwatchers, bicyclists and anyone wishing to get out of the city for a week, a couple of nights, or a weekend. The kitchen has new appliances, pots & pans, all necessary utensils & gorgeous Pine Mills Pottery dinnerware service for eight. There is a back sun porch with rocking chairs and a front porch with a porch swing and Adirondack chairs. Utility room with a washer & dryer. Covered parking for one car and ample parking for more. Central heat and air. The cottage sleeps 4 easily, and 6 if you open the queen sleeper sofa. The love seat also opens into a twin bed for one more. There is also a full size Dream On Me portable crib for an infant or toddler. Smoke-free. No pets. 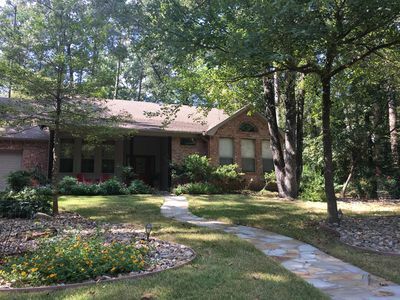 Over the hills and through the woods....this beautiful cottage nestled in the Piney Woods of East Texas invites you to "get out of town" and come relax. 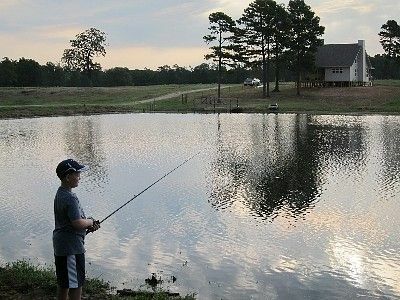 Located inside Holly Lake Ranch, East Texas' premier gated-vacation resort, you'll enjoy amenities such as fishing, swimming, boating, tennis, golf, hiking, and so much more! This fully furnished home has a gorgeous view from kitchen, dining room, and family room of Cattail Lake. Enjoy your morning coffee out on the back deck and stroll down the boardwalk to relax on the brand new deck on a quiet, peaceful lake. This home is perfect for family vacations, and friend's getaway. With 4 large bedrooms, 3 full baths, family room, living room, fully furnished kitchen with eating area at the bar, plus a dining room...you will want "our place" to be "your place" for your getaway! 100 miles east of Dallas and within minutes of Mineola, Gladewater and Jefferson with scores of antique shops, lakes, wineries and not to mention Canton First Monday! Enjoy all of the conveniences of home and more including a large deck with electricity and grill, full kitchen and Simmons Tempur-Pedic memory foam mattress. Free boat ramp. Sleeps 3. Includes Netflix, DirecTV & WiFi. Pets allowed with $50 pet fee. The Space: Little Caney Cabin is a park house offering all of the amenities and comfort of home. The house includes a full kitchen, bedroom with queen size Simmons Tempur-Pedic Memory Foam Mattress, 1000 thread count cotton sheets, high quality futon in living room, flat screen TV with Netflix and DirecTV. The large deck features patio furniture, granite coffee table and charcoal grill. Guest Access: You'll have the whole house to yourself! 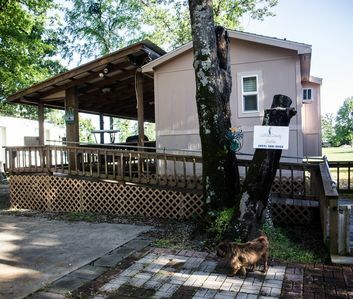 Plus you have access to the amenities of Hideaway Harbor including free boat drop on the deep water ramp, fishing piers and laundry facilities. They also have a general store that is open in the mornings until 10am where they sell a variety of food items, bait, lures, Lake Fork souvenirs and fishing licenses. Interaction with Guests: We live close to the property and are often available if needed. The Neighborhood: Little Caney Cabin is located within the friendly confines of Hideaway Harbor. Getting Around: Sulphur Springs, Emory and Quitman are all about 20 minutes away. Winnsboro and Mineola are about 30 minutes away. For any last minute items, the Dollar General is Yantis has most all necessities as well as some food items. Two Brothers Pizza in Yantis is excellent. Other Things to Note: We have provided the basic kitchen needs, but you will need to bring food, charcoal, milk, or any other specialty items you require. Hair dryer, travel size shampoo, conditioner and shower gel provided. House Rules: Not suitable for infants (under 2 years) No smoking No parties or events Check-in is anytime after 3PM This reservation has a Firm cancellation policy - refunds will be issued up to 60 days prior to the check in date. A 100% refund is provided for travellers cancelling at least 60 days before check-in. A 50% refund of the rental amount is provided for travellers cancelling from 30 to 59 days before check-in. No refunds are provided for travellers cancelling less than 30 days prior to check-in. Our house rules: no smoking, no parties or events, pets permitted. Little Caney Cabin is a cozy 400 sq. 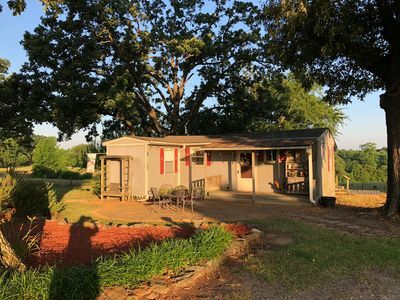 ft. tiny house with everything you need for a Lake Fork vacation. 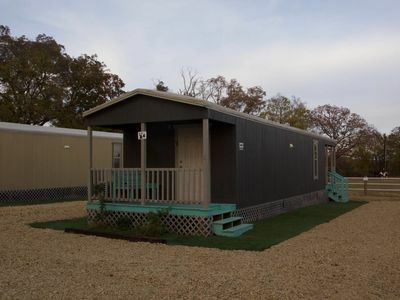 The cabin features a full kitchen, huge deck with grill, queen size bed with Simmons Tempur-Pedic memory foam mattress, 1000 thread count cotton sheets, high quality futon, large bathroom and flat screen HD TV with DirecTV and Netflix. Free and private WiFi connection. We also provide a continental breakfast and Keurig coffee maker. You will also enjoy additional amenities including electric for boats, free boat drop, fishing pier, paid laundry services on site, park area and lake view. This home has it all! A spacious, living area with a wonderful fireplace with lots of room to gather and visit, overlooking one of the clearest lakes around - perfect for swimming, fishing, canoeing or just lounging on the dock. 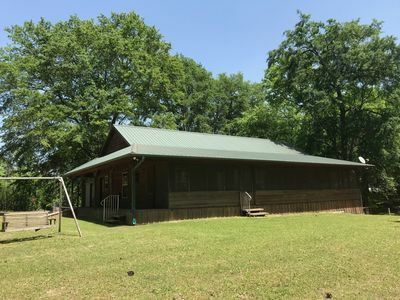 Located inside Holly Lake Ranch, East Texas’ premier gated-vacation resort, you’ll enjoy amenities such as nature-watching swimming, tennis, fishing, canoeing, golfing, bicycling, archery, not to mention an activities center with a game room, a mini-theater and 2 restaurants on premises. This fully-furnished, 3-bedroom, single-level lodge with a massive picture window is perfect for families, girl's or guy's getaway or 3 couples just wanting to get away from the big city for a while. 100 miles east of Dallas and within minutes of Mineola, Gladewater and Jefferson with scores of antique shops, lakes, wineries and some of the best motorcycle riding in the country, you may find yourself saying, “Do we have to go back”? 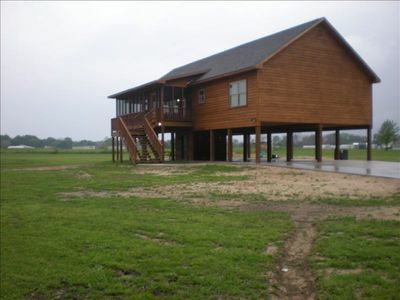 Clear Water Cabin is located in a premier East Texas gated community, Holly Lake Ranch. This beautiful 3 bedroom, 2.5 bath home offers over 2600 square feet of space along with a sunroom, a screened porch, a private deck off the master bedroom and all of these offer a gorgeous view of Holly Lake. Relax on the boat dock in the adirondack chairs and enjoy the beauty of this peaceful, spring fed lake. Or take a ride in the canoe and take in the beauty of the wildlife and the woods! 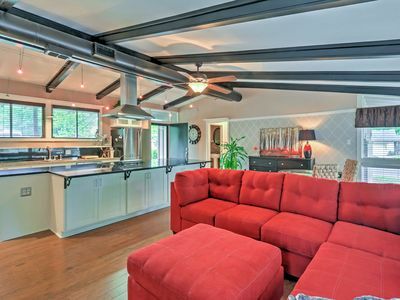 When you're not out on the lake you can relax and watch movies on the flatscreen TV while sitting around a cozy fire in the gorgeous floor-to-ceiling stone fireplace. We even have wood for your use during your winter stay. Or pick out a game or puzzle to work on at the game table which also has a beautiful view of the lake. The kitchen is fully stocked and has granite countertops, stainless steel appliances plus it offers a gorgeous view of the lake while cooking and dining. The dining table will accommodate 6 people and the large kitchen bar will seat 3 more. The kitchen offers tons of countertop space for prepping and serving along with a walk in pantry for food storage. The huge master bedroom is located downstairs and has a reading nook plus, french doors leading out to it's own deck with a lounger. And did we mention the gorgeous view of the lake and woods? The master ensuite bath is large with double sinks, walk in shower and garden tub. This home actually has 2 masters as the guest bedroom has its own ensuite bathroom. The guest room is spacious with a queen size bed, and alarge walk in closet. The ensuite bathroom has a single sink and walk in shower. The 3rd bedroom is in the large loft and has a full size bed along with large windows overlooking the lake and woods. Every room in the house has a view of either the lake or woods or both! In addition to all entertainment this home offers you will have full access to the resort amenities, such as golf, tennis, pickle ball, swimming pools, hiking trails, mini golf, fishing and much more. This may just become your home away from home! Magnificent Lakeside Lodge In Holly Lake Ranch - Just Listed!! Nestled in the piney woods of East Texas and on the lake, the Taylor's Lakeside Lodge has it all! Perfect for a family retreat or a romantic getaway. Located in a premier gated vacation resort - Holly Lake Ranch - you'll enjoy amenities such as swimming- during swimming season, hot tubs, fishing, tennis, canoeing, golfing, hiking, putt-putt, pickle ball, and much more. The resort has an activities center with a game room, mini theater and 2 restaurants. This exquisite full- furnished home has just been completely remodeled. With 4 bedrooms and a loft bedroom, this vacation home can accommodate up to 20 people. You might choose to gather in the spacious living room, sit on 1 of 3 decks for a sunset view or grilling, fish off the private dock, or sit around the firepit and make s'mores. We even include a paddle boat and canoe for your enjoyment! The master bedroom with a master bath has a queen memory foam bed and overlooks the lake. Bedroom number 2 has a luxurious queen memory foam bed. Bedroom number 3 overlooks the lake and has a queen memory foam bed as well. Downstairs is a large 4th bedroom which overlooks the lake and has 2 twins with trundle beds and a full size bed which allows for 6 guests to sleep. Upstairs in the loft are 4 extra large twin beds and a pull out lounger allowing an additional 5 guests to sleep. The living room has 2 sleeper loungers as well as a comfortable couch for sleeping. There is two extra twin mattresses available for sleeping as well. 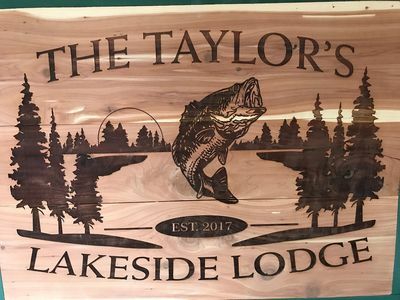 We hope your family gets the opportunity to visit this premier resort and enjoy all that it and The Taylor's Lakeside Lodge has to offer! Please check out our other properties - The Taylor's Peace of the Pines and The Taylor's Whispering Pines. Guests are sure to enjoy a memorable vacation in this fully furnished, 4 bedroom/3 bath residential property. New flooring and paint downstairs. The main/master bedroom has a king-sized bed, while the 3 remaining rooms are furnished with 3 twins and 2 full-sized beds, comfortable for sleeping 10 people. There are two living spaces available. The large comfortable living room is furnished with a couch, love seat , large tv and working fire place. The kitchen is perfect for dining as it is equipped with all basic cooking gear, including stove, oven, microwave, coffee pot, and dishwasher. Situated on a 5 acre stocked pond, guests can enjoy an evening of fishing, porch sitting, and later watch the sunset from the back porch. Spend the day away, enjoying nearby attractions such as Downtown Sulphur Springs, with multiple restaurants, with events, Lake Cooper, Lake Fork, Coleman Park Softball and Baseball fields and several golf courses within 20 miles. Tucked away in the Piney Woods of Holly Lake Ranch you will find this adorable hideaway the perfect place to build family memories! This 3 bedroom, 2 bath house has a brand new boat dock on a gorgeous private lake, has a game room with ping pong table and pool table, and is walking distance to many of the resort amenities available to vacationers! Plus, it is quiet and secluded! What more could you ask for? Two of the bedrooms are bunk rooms with 2 sets of bunkbeds in each...perfect for kids! The master bedroom has a king size bed and a balcony overlooking the beautiful view of the woods and the lake. After staying here you may not want to go home! 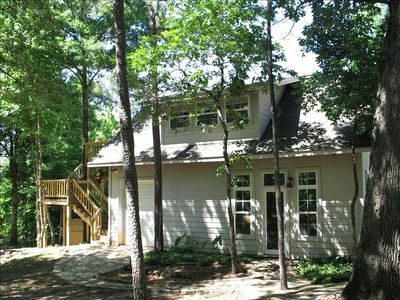 The Tree House sits on 4 lots at Holly Lake Ranch, TX, a resort in the piney woods of east Tx. It allows perfect privacy for our guests, you cannot see another house. The creek area at the back of the property is very secluded and even has a tree swing. It has an outdoor living area on the deck and a fire pit in the yard. Upon walking into the house it immediately draws you in with the stone fireplace and all the comfortable places to relax and enjoy company or just enjoy viewing deer in the yard. The entire impeccably decorated, furnished and stocked house will be yours to enjoy. The kitchen has the dishes and pans to prepare a gourmet meal. It is inside Holly Lake Ranch resort where most activities are free of charge. Kids can enjoy the activity center, pool, and numerous lakes to fish or boat. No fishing license is required on the Ranch. Other activities are, pickleball courts, tennis courts, walking trails, play ground, basketball courts, shuffle board, Frisbee golf, billiard parlor, table tennis, picnic areas, dog park, badminton, and sand volleyball. Eighteen holes of golf, driving range, 5 lakes for fishing, paddling, and swimming. 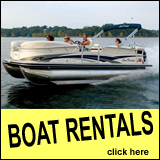 Boat rentals and fishing supplies, snack bar and full service restaurant. The house is kid friendly and they will like the 6 built in bunk beds. Toys, games and videos are provided. This home provides plenty of room to spread out and make wonderful memories. This house had 34 reviews, 30 5star, 4 4 star but was taken off Homeaway for 3 months and the reviews can not be transferred back. Welcome to Deer Haven, gorgeous home surrounded by woods and wildlife, sleeps 6. 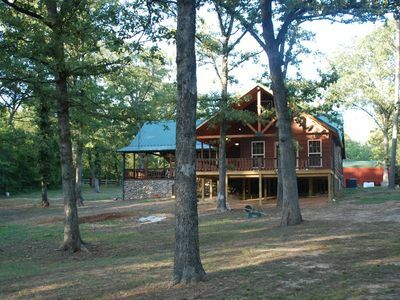 Welcome to Deer Haven, located inside Holly Lake Ranch, East Texas' premier gated-vacation resort. There is a reason we call this gorgeous 3 bedroom, 2 bath home "Deer Haven". It sits on 3 beautiful wooded lots on which the deer love to roam! It is not uncommon to see does with their babies or a few bucks hanging out in this wooded area. Plus, Lake Greenbriar is just a short walk from this home for those outdoor enthusiasts who like fishing or boating. This home is perfect for couples getaway or family gatherings. It has 2 king bedrooms and 1 queen bedroom. The large master bathroom has double vanities and walk-in shower. The guest bath has a large single vanity and shower/tub combination. The open concept living room is spacious and offers plenty of seating for families to gather. And to top it all off....the sun room is totally set up as a "man-cave" for those who want to enjoy a peaceful setting with an outdoor theme! The large open kitchen is fully equipped with everything needed for family meals, a breakfast nook with seating for 4, and modern appliances. The dining room has a large farmhouse table that seats 6-8 comfortably for meals or for family games. 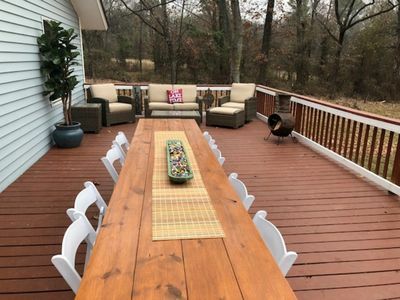 Enjoy morning coffee or an evening glass of wine out on the back patio while gazing at the wildlife and piney woods, far away from the hustle and bustle of city life! And you will never run out of things to do at Holly Lake Ranch....swiming pools, tennis courts, pickle ball courts, miniature golf, basketball, shuffle board, ping pong, hiking trails, activity center, 18-hole PGA golf course, plus restaurants. This home offers a quiet, peaceful setting in a resort community where there is something for everyone to enjoy!